T-cells are a subtype of white blood cells which play a key role in the immune system and fighting cancer. Let's break down the immune system into parts to make it easier to understand. There are 2 primary types of white blood cells (leukocytes): lymphocytes and granulocytes. T-cells are part of the body's cell-mediated immunity, the part of the immune system which you can envision as directly killing bacteria, viruses, and cancer cells. The other type—humoral immunity—protects our bodies from these invaders by making antibodies. Cytotoxic T-cells: Cytotoxic T-cells find and directly attack foreigners such as bacteria, viruses, and cancer cells. Helper T-cells: Helper T-cells recruit other immune cells and organize an immune response. Regulatory T-cells: Regulatory T-cells are thought to suppress the immune system so that it doesn't overreact (as it does in autoimmune diseases), however central aspects of the biology of these cells remain shrouded in mystery and continue to be hotly debated. Natural killer T-cells: Natural killer T-(NKT)-cells are not the same thing as natural killer cells, but they do have similarities. NKT cells are cytotoxic T-cells that need to be pre-activated and differentiate to do their work. Natural killer (NK) cells and NKT cells are subsets of lymphocytes that share common ground. Both can rapidly respond to the presence of tumor cells and participate in anti-tumor immune responses. Memory T-cells: Memory T-cells remember markers on the surface of bacteria, viruses, or cancer cells that they have seen before. After they are produced in the bone marrow, T-cells spend some time maturing and developing in an organ in the chest called the thymus—this is why they are named T-cells, which stands for thymus-derived cells. After maturation, T-cells are present in the blood and in lymph nodes. T-cells play a large role in our fight against cancer. It can be very confusing to talk about T-cells, especially when talking about cancers such as lymphoma, so we'll look at ways that T-cells work to fight cancer and how they may be affected by cancer. To get rid of cancer, even if there are enough T-cells, they first have to "see" cancer. T-cells work in both direct and indirect ways to fight cancer. 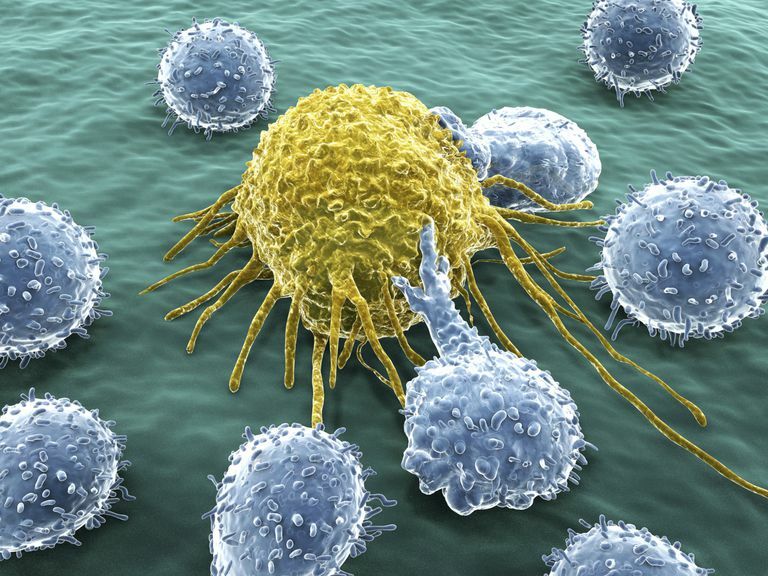 Killer T-cells kill cancer cells directly. These cells first find cancer cells and can also be stimulated to kill cancer cells. Helper T-cells fight cancer indirectly. These cells organize and orchestrate the fight against cancer. Direct involvement in cancer: In cancers such as T-cell lymphoma, the T-cells themselves are cancerous. Bone marrow takeover: Lymphomas and other cancers which spread to the bone marrow crowd out healthy stem cells in the bone marrow (precursors of T-cells) resulting in the depletion of T-cells. Destruction due to chemotherapy - Chemotherapy can directly deplete T-cells and other white blood cells. A newly emerging research therapy involves re-engineering a patient’s T-cells so that they can recognize and kill cancer cells. This type of therapy has shown promising preliminary results in lymphoma. T-cells are part of what is known as the cancer-immunity cycle. As cancer cells die, they release antigens, substances that can be recognized by the immune system. Antigens from the cancer cells are then taken up and presented on the cell surface of special immune cells called antigen-presenting cells (APCs) so that other immune cells can “see” the antigens of interest. In the lymph nodes, the APCs activate the T-cells and teach them to recognize the tumor cells. The T-cells then travel via the blood vessels to reach the tumor, infiltrate it, recognize the cancer cells and kill them. American Cancer Society. What’s New in Cancer Immunotherapy Research? 11/05/15. Chen, D., and I. Mellman. Oncology Meets Immunology: The Cancer Immunity Cycle. Immunity. 2013. 39(1):1-10,25. Chen, D., Irving, B., and F. Hodi. Molecular Pathways: Next Generation Immunotherapy – Inhibiting Programmed Death-Ligand 1 and Programmed Death-1. Clinical Cancer Research. 2012. Doi:10.1158/1078-0432.CCR-12-1362.